Registered September 1974 N plate. Vehicle was originally a 6 cylinder petrol but someone changed it to a 2 1/4 petrol and it states 2300cc petrol on V5 so they changed it with DVLA at the time. Chassis is scrap and totally gone. This was a vehicle that we broke a few years ago and I transferred it to my name and declared it SORN. Ideal galv rebuild or export vehicle? HPI Clear, not stolen, written off, all docs match up etc. I can take credit/debit card, cash, or bank transfer. V5 & other docs will be posted 1st class recorded. 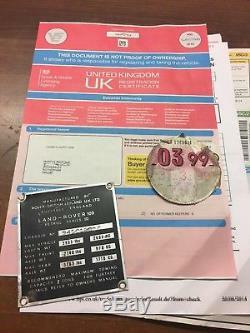 The item "Land Rover Series 3 Chassis scrap, V5 log book, 109 SORN in my name HPI Clear" is in sale since Monday, March 26, 2018. This item is in the category "Vehicle Parts & Accessories\Car Parts\Other Car Parts". The seller is "4x4xparts" and is located in Sheffield. This item can be shipped to United Kingdom.